Dairy farmers Trevor and John Whitfield are already reaping the rewards of farm health planning under a new initiative. 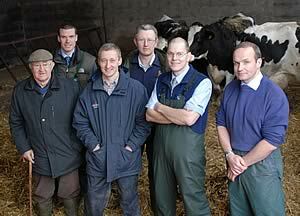 The Whitfields and their advisers - left to right, John Whitfield, senior, Richard Vecqueray, Trevor Whitefield, John Whitfield, Bruce Richards and Ian Ohnstad at Woodhouses Farm, Great Orton. The brothers are fine-tuning the health of their pedigree Holstein herd at Woodhouses Farm, Great Orton, Carlisle, as one of eight advocate farms involved in the XLVets Dairy project run under Defra’s Farm Health Planning scheme to encourage farmers to be proactive about their cattle’s health and welfare ultimately resulting in financial benefit. In the current financial year, Defra is funding 27 dairy and beef Cattle Health Plan Initiatives to the tune of £1.6 million, and XLVets member Paragon Veterinary Group, based at Dalston, near Carlisle, selected the Whitfields as their advocate farm. The XLVets Dairy project advocate farms cover a wide range of farming types, some are owned, others are tenanted. Parlour types vary from eight to 24 milking units through to robots, and include both pipelines and recorder jars, herringbones and tandems. Some are entirely on TMR and others feed concentrate in the parlour with silage at a trough. The type of housing tends to reflect locality. Woodhouses Farm, which was the focus of a farmers health planning open day currently stocks 150 milking cows in its pedigree Garnet herd run on 260 acres, 180 of which are owned and the remainder rented. The herd was lost during 2001’s foot and mouth epidemic. The previously commercial black and white herd of 70 milkers has now been increased since re-stocking with cattle from three herds. The year-round calving herd averages 9,000 litres at 3.2% protein and 4.4% butterfat. Cows are fed on a TMR of grass silage, maize, wholecrop wheat and a protein blend, topped up in the parlour with a 20 per cent protein concentrate. Paragon’s Bruce Richards said: “Through fortnightly routine visits we have, like on many of our farms, continuously identified and tackled health and production issues which have been causing problems. “What we haven’t done in the past is to actively document and plan the strategies and control measures, allowing us to review and benchmark them regularly as a means of measuring progress and more importantly, recognising the financial value of these action plans and Herd Health Planning – something we all do subconsciously. The incidence of milk fever. The recently rising bulk tank SCC and associated mastitis rate. The recent high incidence of lameness. “This exercise has already demonstrated that not enough effort goes into herd health planning,” said Trevor Whitfield. “We will be very interested to see the final outcome. Although lameness had been identified as a problem, it had not been quantified. In the last 12 months 23 cows per 100 cows had been recorded as having received treatment for lameness, but this figure probably underestimated the problem. A locomotion score carried out in August showed that 28% of the herd were lame on that day - a high incidence with huge implications in terms of milk yield, fertility and particularly welfare. There are many factors contributing to this problem – the aim of the herd health planning initiative is to identify each of the contributing factors and prioritise solutions, depending on the impact they’re likely to have, and the cost and time involved in implementing them. At a cost of practically nothing, Trevor recently demolished a wall in a shed so that he could set up his crush permanently to make trimming cows feet less of a chore, and hopefully the cows will feel the benefit. He has gates set up so that he can separate off cows at milking time and get them into the crush quickly and easily on his own. A high level of milk fever was one area Trevor and John identified as needing attention. MF occurred at an incidence of 14%, with an average cost per case of £209 (£40 - £1655) with 5 animals culled due to downer cow syndrome each costing over £1655. Together with Richard Vecqueray an action plan has been implemented. Forages and the dry cow TMR have been analysed, with emphasis on mineral status. Blood and urine have been collected from transition cows to analyse their acid-base balance (a major cause of MF), their macromineral excretion and their energy status pre-calving – a major contributor to fat mobilisation pre and post calving. Preliminary results reflect a high potassium and sodium intake and consequential poor calcium mobilisation so a specific diet has been formulated and fed to the dry and transition cows. Once under control, the team will look toward maximising the milking ration which has met production levels but is not consistent with optimal herd health and fertility. MOPF is excellent but by improving and maintaining milk quality, some margin for improved feed rates should be available, at the least for improved cow health and fertility. The increasing bulk tank BVD level could have implications on the fertility and health of the herd which has a current calving interval of 413 days. Blood testing of cohort groups has been carried out to identify the level of disease across the herd and to consider if herd vaccination would be cost-effective. Cell counts at the start of the initiative were well above 200 and threatening to put the milk into a lower price band, now they have been reduced to 150. With Ian Ohnstad, a mastitis action plan is being devised looking at the milking machine and teat management and hygiene. Environmental problems, such as poor ventilation in cubicle housing, have already been identified, resulting in some modifications to existing buildings.